I have had an Apple ID that predated iTunes. It wasn?t in the form of an email address, it was just ?funpaul?. 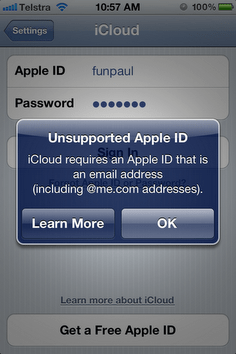 iCloud requires an Apple ID that is an email address (including @me.com addresses). After searching for way too long searching for the solution, I discovered that I had to change my Apple ID into an email address style Apple ID, but I?d been buying stuff from the AppStore and iTunes with just the original ID for years. My kids knew it and have spent hundreds of dollars using it over the years. Viola you?ve updated your Apple ID. Warning this is a one way trip, you lose your ability to log in with your old Apple ID on iTunes, App Store and other Apple properties. But that?s the cost of progress, it is unlikely that old non-email format ID?s will remain useful as the Apple ecosystem grows. Hope it helps, say thanks in the comments below. If your Apple ID is staying as an old-fashioned username (no @ symbol) that is a problem you have to fix with Apple. Try calling them. Are you sure you?ve logged in correctly?